The ViewSonic VP2768 forms part of their professional series and is aimed at those working with graphic design, photography and the like. Screen quality is the emphasis here with a SuperClear IPS panel providing 8-bit colour depth capable of running at 1440p (QHD) resolution. Interest in QHD is growing fast, as technology moves on the mid range graphics cards of today are now able to make a good job of 1440p. Sure, you may have issues gaming at this resolution, you’ll need a powerful PC to run modern games at ultra settings, but most of us will get by fine. 27″ is the right size for QHD giving you a sharp pixel density whilst avoiding the problem of tiny text in all of your applications. As you can see from the photos, the other stand out feature here is the elegant design, it has a sleek “frameless” approach and an overall appealing ergonomic fluidity, Viewsonic clearly want this to appeal to the designer types. But it’s not just aesthetics, the thin surrounds lend themselves to a multi-monitor setup – assuming you can afford to buy a couple of these! The ViewSonic VP2768 comes with a fully adjustable stand and in this price bracket you’d really expect that. For those, like me, that like to go a step further and mount our monitors you’ll be pleased to know VESA 100 x 100 fixings are also in place. An anti-glare coating helps to minimise reflections on the matt screen. As already alluded to in the intro, we’re also impressed by the slim bezels bordering the Viewsonic, handy for the professional who wants to line up two or more screens next to each other. You can hook up your PC via DisplayPort or HDMI, there are two of the latter so if you have additional devices to plug in you’re in luck. The modern connectivity is required to run at high res so if you still have a VGA based graphics card, it’s time to upgrade I’m afraid! I’ve always been a fan of Viewsonic, I currently own one of their gaming screens, and this model goes all out to impress. If you are looking for top quality colour performance then the VP2768 delivers. For a start, each monitor is factory calibrated to provide a Delta E value. Viewsonic claim to provide the ultimate colour processing capability and consistent chromaticity across the display. 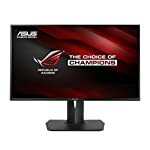 The QHD 2560 x 1440 resolution is also going to appeal to professionals, this gives a 109 pixel density on a 27″ screen which is what most people agree is a good level to work at. Too low and images can look pixelated, too high and text can appear small. 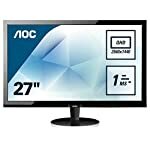 Gamers will probably want to look elsewhere, at this price there are other 27″ game orientated monitors that offer adaptive sync and 144hz refresh rates that aren’t on offer here. The slow response times could lead to ghosting although a browse through the user reviews actually reveals owners seem content with the casual gaming experience. We give the ViewSonic VP2768 a 4.5 out of 5 rating. Want to know what existing owners of the monitor think? You can read real user reviews here. 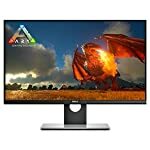 Should I buy the ViewSonic VP2768? The ViewSonic VP2768 is aimed at professionals looking for top qaulity image performance. The monitor is not cheap, but you tend to get what you pay for. This delivers. If you are having some doubts about this purchase then why not read some real owner reviews and see what other buyers think. Welcome to the ViewSonic VP2768 FAQ. This section attempts to answer common questions you may have, please get in touch if you have any more queries or if you think our answers need updating. Do you know if this is suitable for a Mac? I’m afraid I don’t have a lot of experience with Apple products but according to Viewsonic’s website you should be fine. Looking down their specs I can see “Power Mac (up to 2560 x1440 HDMI/DisplayPort)”. If in doubt, ask your vendor. Is this is HDMI 2.0? No, you get two HDMI 1.4 ports. One for your PC, one for your games console!